Lucy Liu joined Denise Gough for the 63rd Annual Obie Awards on Monday (May 21) in New York City, where she was a guest presenter. The actress used the occasion to give her new summer blonde tresses their red carpet debut. While I will let my feelings on her hair settle for a few outings, I will say I love her Givenchy Spring 2018 dress. 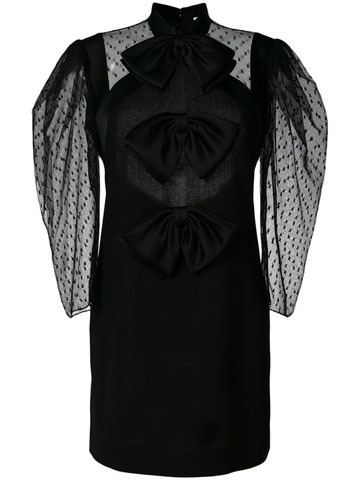 I know bows, especially a multitude of them, can be a hard sell on a grown woman as the look is often labelled as too twee, but if anyone can make the sweet sensibilities of this dress work in their favour it’s Lucy. You may remember that Dakota Johnson also had a successful outing in this same frock.